Although a hot 10-3 start to the season left little to adjust for the baseball team, the club has managed to improve in the time since. Those 13 games were carried by very impressive hitting displays, but occasionally were tainted by less than stellar pitching. Since then, the pitching staff has not just settled in, but has shown dominance, leading the team to three wins, including two against rival Colby. The Cardinals 13-3 record represents the best mark in either the NESCAC East or NESCAC West, edging out 12-3 Amherst and setting up what appears to be a fierce two-way race for the NESCAC West crown. The first game of the week came at home against nearby Eastern Connecticut State University. Starting pitcher Ethan Rode ’17 came out of the top of the first unscathed, and the Cardinal bats immediately went to work, putting up two runs in the bottom half of the inning. Eastern pulled even in the top of the third, and although the Cardinals regained their lead quickly, they could not put the game away despite Rode’s strong outing and Nick Miceli ’17’s hitless performance in relief. This changed in the eighth inning, when a five-run rally was keyed by hits from Miceli, Will O’Sullivan ’17, Jordan Farber ’16, Matt Jeye ’18, and Marco Baratta ’16. Now with a 9-2 cushion, Miceli cleaned up the away side in just three at-bats in the game’s conclusive frame. This result gave Rode his third win of the season, while Miceli picked up his third save. Miceli also leads the team in wins, appearances, strikeouts, and earned run average among players with at least ten innings. Miceli, Jeye, and Farber each reached base three times in the game, while Baratta successfully found his way onto base four times. The first win against Colby was much more competitive than the second. In game one of the doubleheader in Maine, Peter Rantz ’16 threw six innings of one run ball while striking out five. The Mules struck for that one run in the bottom of the second inning before Wesleyan was able to cross the plate, and held onto the lead for quite awhile as Colby ace Soren Hanson had little trouble with the Cardinal bats. Hanson, a reigning first-team All-NESCAC selection, was almost flawless until Baratta drove home Farber in the top of the fifth. Hanson was relieved in the top of the seventh, and Wesleyan quickly struck for two unearned runs to open up a 3-1 lead in the seven-inning contest. Miceli was called to pitch the final frame, and unsurprisingly threw a scoreless inning to secure his fourth save of the year. While stellar pitching may have been crucial in the first game, Wesleyan’s bats did more than their fair share in the next tilt, scoring early and often against every pitcher the Mules had to offer. Miceli got the starting nod for the Cardinals, but was taken out after five, perhaps because his services were clearly not needed. By the end of the third frame, Wesleyan had opened up a 14-0 lead, eliminating any doubt from the previous game as to which team was in control of the day. Many Cardinal starters were removed fairly early in the game, and their replacements were more than competent in relief. Among the less familiar contributors were Danny Rose ’19, Nick Coppola ’18, and A.J. Ferrara ’18. After nine innings of lopsided baseball, Wesleyan stood on top, 21-1. Miceli picked up his fourth win while surrendering one run in five innings of work. Meanwhile, Asher Young ’17, Dylan Millhouse ’18, Ryan Earle ’19, and Wilson Flower ’16 each threw a scoreless inning of relief and combined to face only 13 batters, which totals at just one more than the lowest possible figure. Andrew Keith ’19 accounted for six runs on offense, while Guy Davidson ’16, and Ellis Schaefer ’17 each accounted for five. 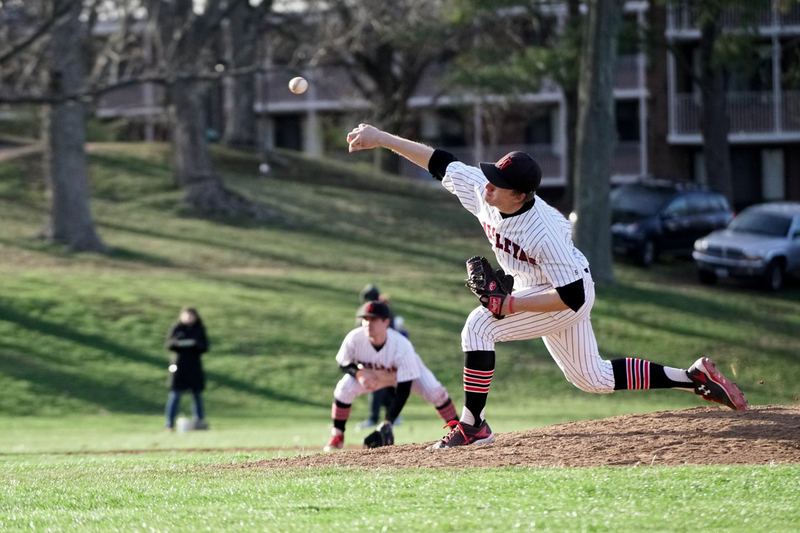 Pitcher Michael McCaffrey ’19 had a few thoughts on how the pitching staff has came into its own so quickly, and what improvements they are hoping to make going forward. Catcher Eric Jones ’16 works closely with the pitching staff, and also contributed some possible reasons for the unit’s improvement. McCaffrey also commented on Miceli’s contributions to both run prevention and run scoring. The Cardinals take on Western Connecticut State University next on the road, and will kick off their NESCAC West schedule against Middlebury at home on Friday, April 8.